If you’re looking for a delicious, tender, soft, flavorful, and juicy turkey for your Thanksgiving gathering look no further! This is the best tasting recipe you’ll ever make!!! It feels like we’re back to normal after surviving 5 days with no electricity. Not all of our city is fully restored yet and some families will spend Thanksgiving without power. What damage the windstorm caused to Spokane region in just 3 hours, cannot be restored in 3 hours. We are so thankful to God for all the mercy He extended to us in the past 5 days. This Thanksgiving will be especially special to us. We will be thanking our great God for all we have and we are so used to it that most of the time we don’t appreciate. We remembered the olden days and will be even more thankful for all God provides for us as our neighbor Linda said. I made this Lemon Pepper Turkey recipe last year, and for many years already, and I find it that cooking the turkey in an oven bag turns out the best, tender soft, and juiciest meat. 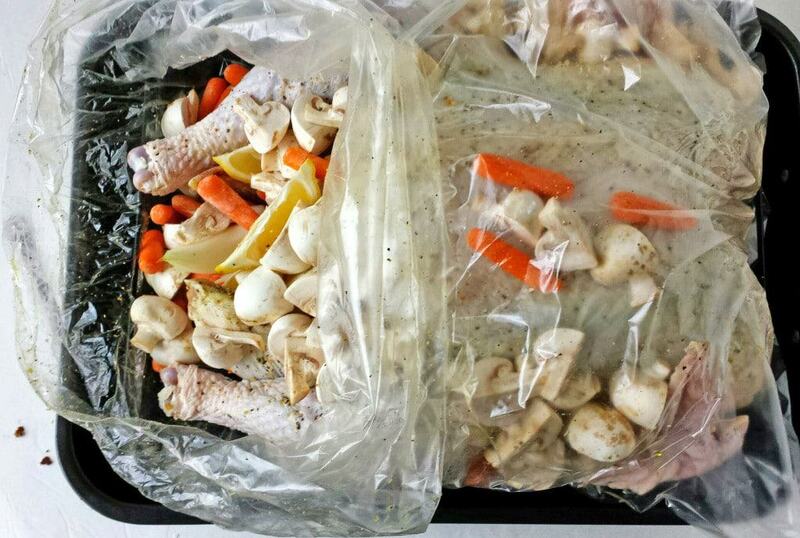 No matter how much butter, oil, and spices you use, if it isn’t cooked in the oven bag it still turns out dry. You will agree with me after trying this recipe. Let me know what you think. 1. 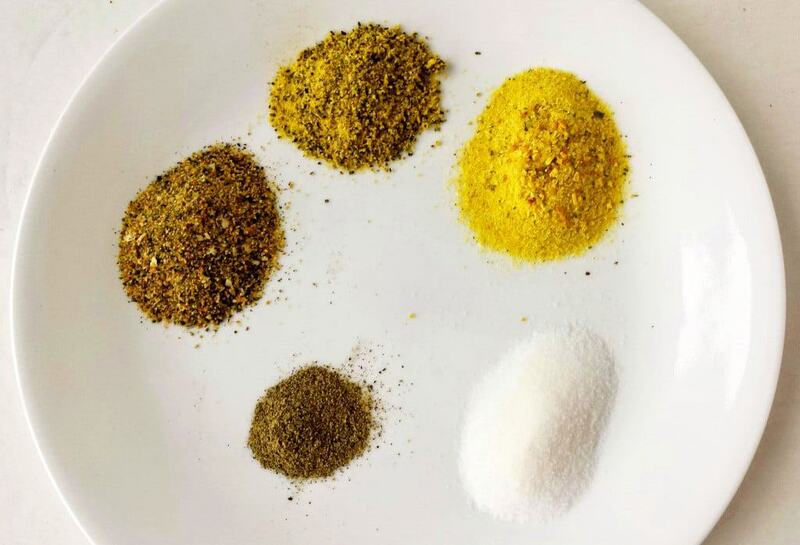 Place all the measured spices onto a plate. 2. Mix it all together with a spoon. 3. 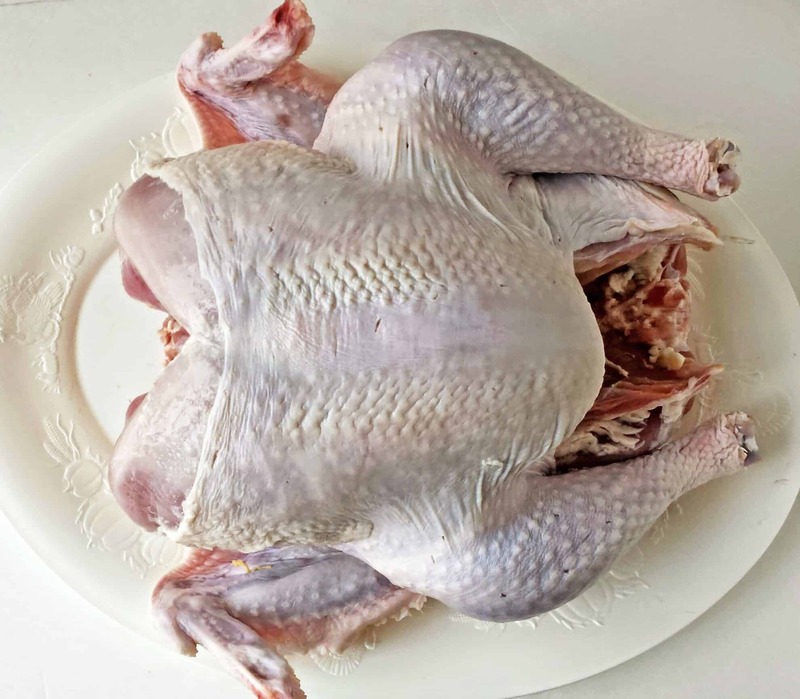 Remove the neck and the pack from inside of the turkey (you can do whatever you want with it). Wash the turkey. Cut off all the fat. 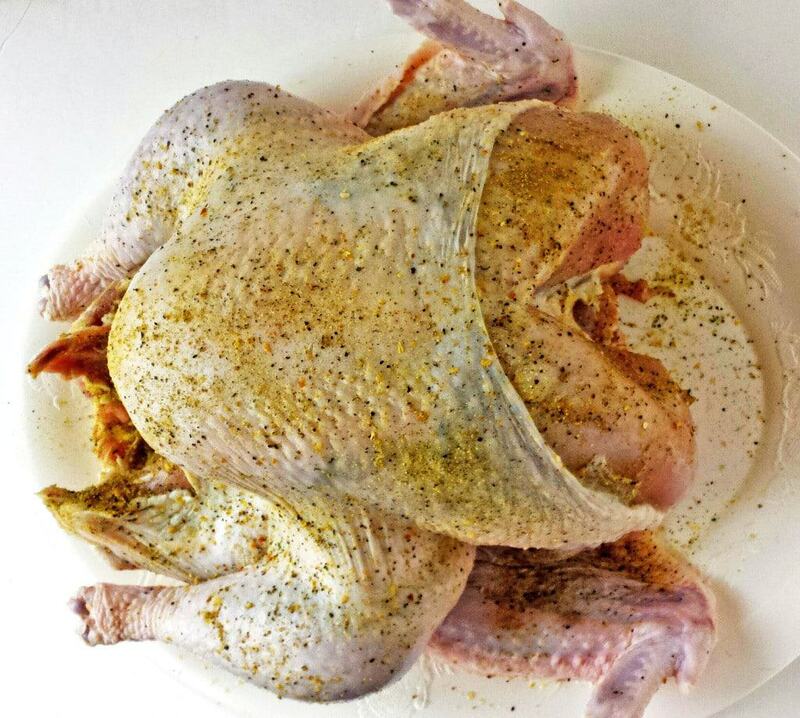 Rub entire turkey (inside and out) with olive oil. Sprinkle the mixed spices onto entire turkey (inside and outside). 4. Place the turkey into an oven bag, and then place it onto a turkey pan. Place the turkey in a fridge for at least 12 hours for the turkey to soak all the spices in. Preheat the oven to 350 F. Cut mushrooms into half or quarters. Cut lemon and onion into wedges. Sprinkle 1 tbsp. of all-purpose flour onto an oven bag as instructed on the package (it should prevent the bag from bursting, although the bag did burst once for me). Remove the turkey from a fridge 30 min before cooking. Pack 3 garlic cloves, cut vegetables, and carrots on the inside of the turkey. Place remaining of the vegetables on the outside of the turkey. Tie the bag with a bag tie provided. Place the turkey on the lowest rack in the oven. Cook the turkey in the oven for 4 hours or until the temperature probe registers 165 F. Remove from the oven let the turkey cool for about 30 minutes. Cut the bag open and remove the turkey onto a platter. Place all the cooked vegetables that were on the outside of the turkey onto a platter next to the turkey. If you're looking for a delicious, tender, soft, flavorful, and juicy turkey for your Thanksgiving gathering look no further! This is the best tasting recipe you'll ever make!!! Place all the measured spices onto a plate. 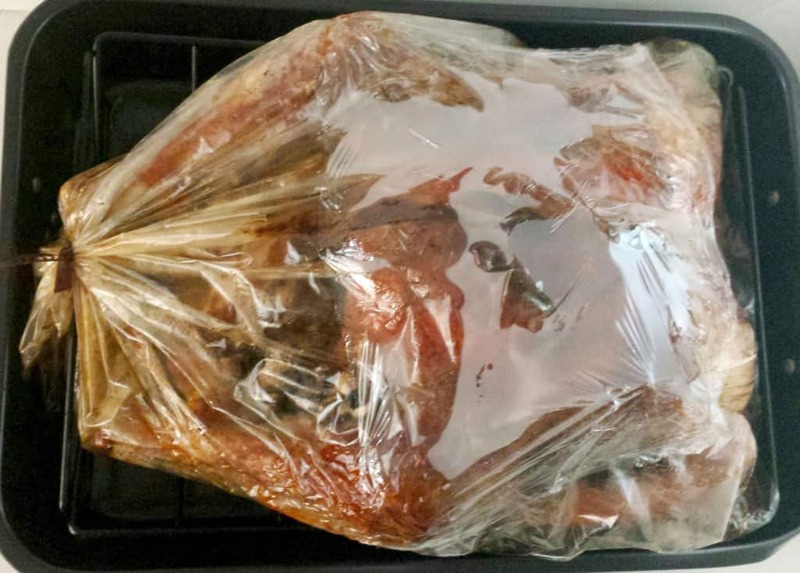 Remove the neck and the pack from inside of the turkey (you can do whatever you want with it). Wash the turkey. Cut off all the fat. 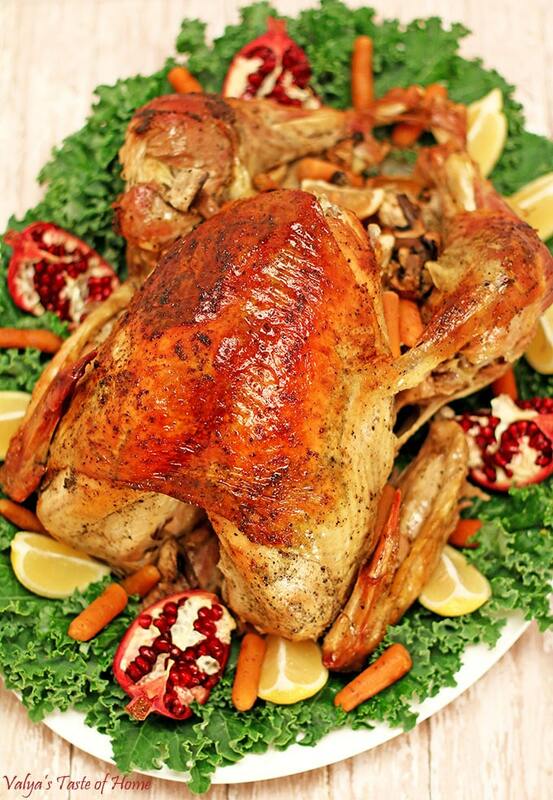 Rub entire turkey (inside and out) with olive oil. Sprinkle the mixed spices onto entire turkey (inside and outside). 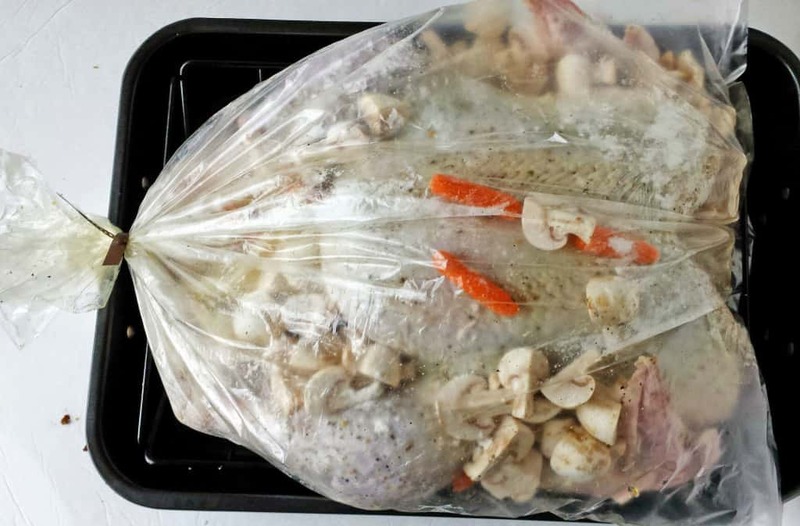 Place the turkey into an oven bag, and then place it onto a turkey pan. 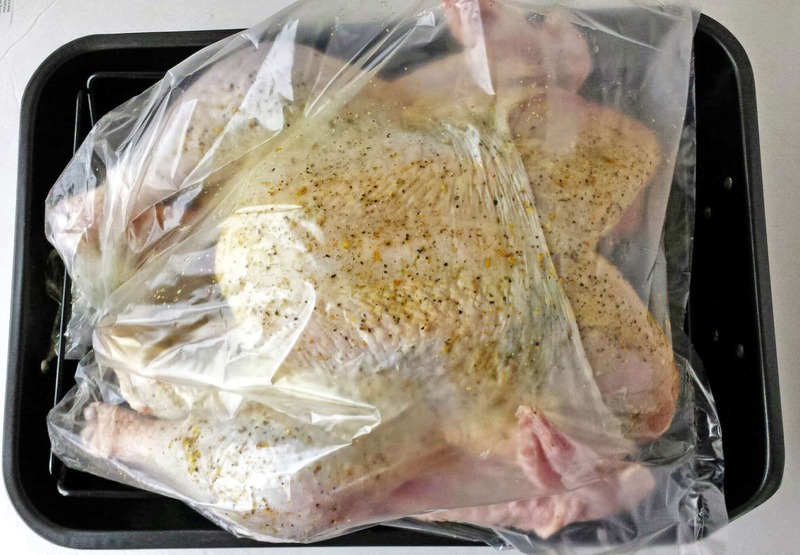 Place the turkey in a fridge for at least 12 hours for the turkey to soak all the spices in. 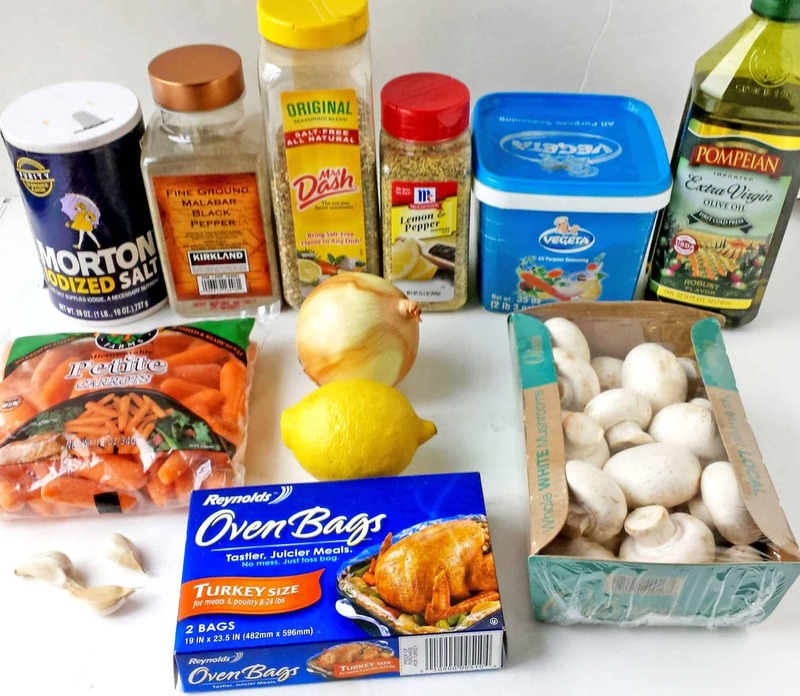 Preheat the oven to 350 F. Cut mushrooms into half or quarters. Cut lemon and onion into wedges. Sprinkle 1 tbsp. of all-purpose flour onto an oven bag as instructed on the package (it should prevent the bag from bursting, although the bag did burst once for me). Remove the turkey from a fridge 30 min before cooking. Pack 3 garlic cloves, cut vegetables, and carrots on the inside of the turkey. Place remaining of the vegetables on the outside of the turkey. Tie the bag with a bag tie provided. Place the turkey on the lowest rack in the oven. Cook the turkey in the oven for 4 <g class="gr_ gr_350 gr-alert gr_gramm gr_inline_cards gr_run_anim Grammar multiReplace" id="350" data-gr-id="350">hour</g> or until the temperature probe registers 165 F. Remove from the oven let the turkey cool for about 30 minutes. Cut the bag open and remove the turkey onto a platter. Place all the cooked vegetables that were on the outside of the turkey onto a platter next to the turkey. 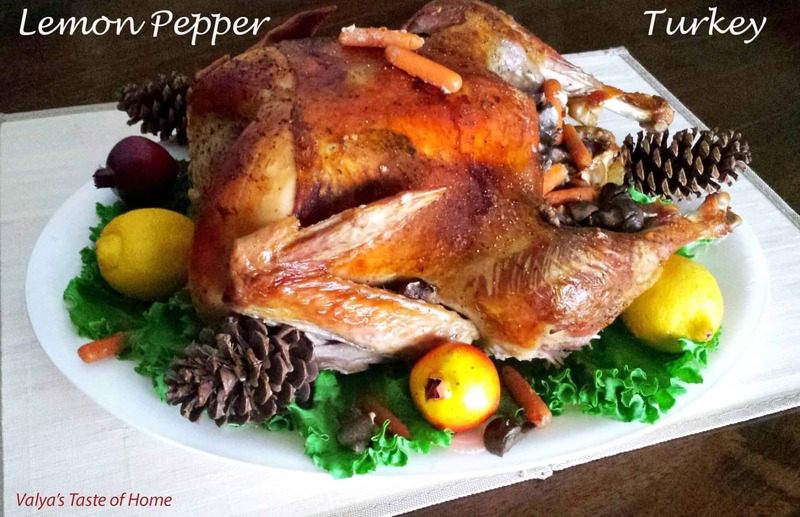 If you make this Lemon Pepper Thanksgiving Turkey Recipe please share a picture with me on Facebook, Instagram or Pinterest. Tag with #valyastasteofhome. I’d love to see your creations!? I want to make this turkey, let me just say it’ll be my first time cooking for my family, I wanted to know if I have a frozen 22lb turkey, when do I take it out of the freezer for it to start thawing and prepping it to cook!?? Do I cook it at the same temperature and same amount of time if I use a turkey roaster? My oven is not large enough to cook the turkey so I a having to use the turkey roaster. I’ve never cooked it in the turkey roaster. You might have to stand by it to check how fast the turkey is cooking. Making this tomorrow for Friendsgiving! Following your recipe exactly except for the mushrooms, a lot of people don’t like mushrooms I suppose! I’ll let you know how it comes out. Friendsgiving sounds great! Thank you for trying out my recipe, can’t wait to hear back from you on how it turned out. I want to try this recipe for thanksgiving but have a 7 pound turkey breast. Do you think it would work? The pic of your ingredients shows a lemon, but is not in your “list” of ingredients. Do you put the lemon inside the cavity? Thank you for noticing that, it got fixed. Yes, (cut lemon into 8 wedges) put some lemon wedges inside the cavity and few pieces on each the side on the outside of the cavity. I hope this helps. Happy Thanksgiving! There’s a lemon in your pic of ingredients needed. It’s not in your list though. Is it to be cut & placed in the cavity? My turkey is 12.5 lbs. how long do I bake it @ 350? Cook the turkey for 3 hours and then check the turkey meat with a thermometer until the temperature reaches 165 F. That’s when the turkey is done. Didn’t intend to post twice!!! Need to know about the fresh lemon? Do I slice & put it in the cavity? I already answered this question for you in the comment above, but just in case you missed it I’ll repeat it again. Yes, (cut lemon into 8 wedges) put some lemon wedges inside the cavity and few pieces on each the side on the outside of the cavity. What could you use to substitute the ingredient vegeta? Vegetal can be substituted with Mrs. 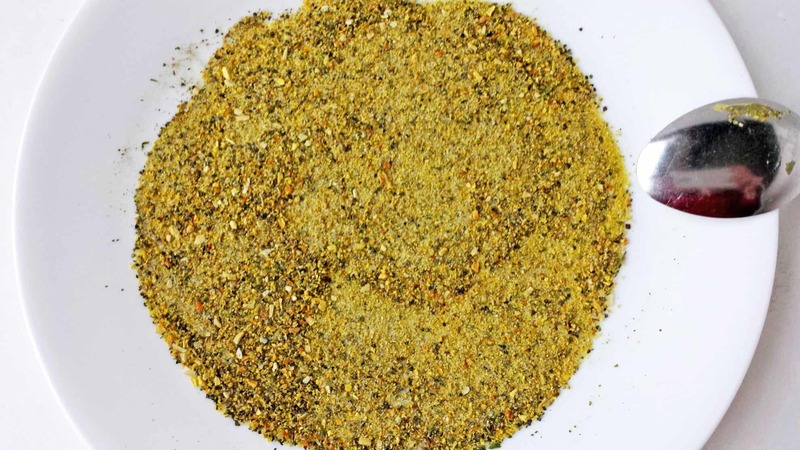 Dash seasoning.